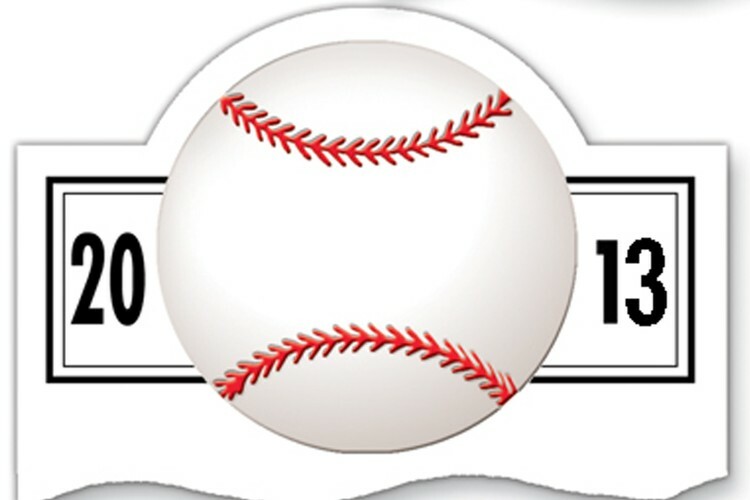 Sports are a big part of any community! 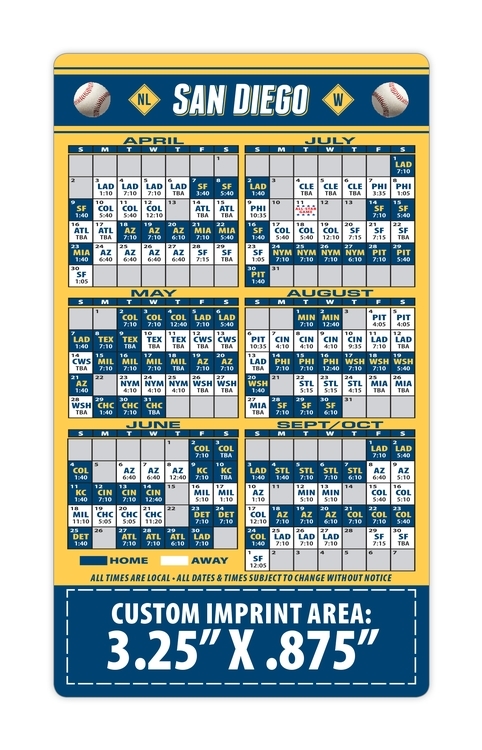 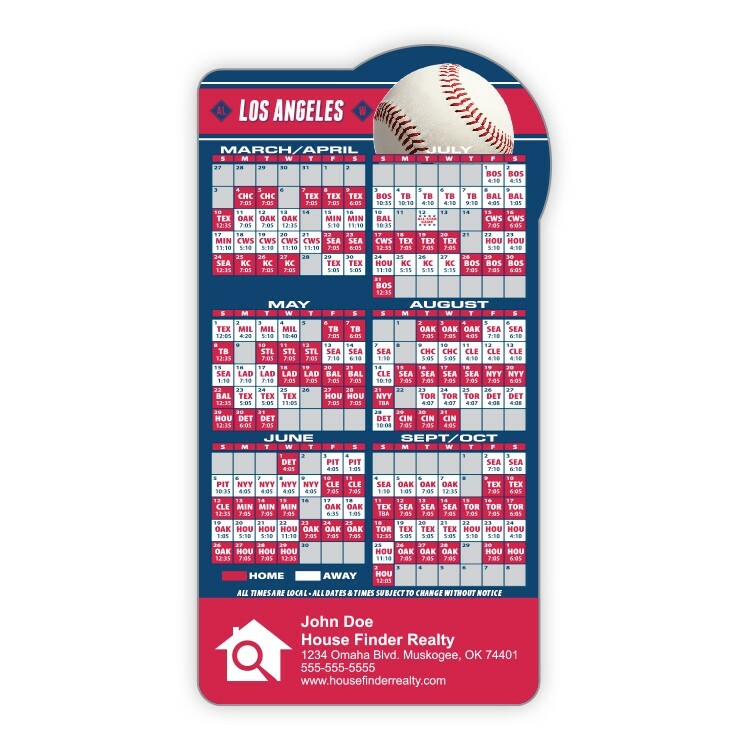 By adding your company name and logo to a 5 3/4" x 4 1/8" baseball themed schedule magnet you can show your support for local teams and your neighbors as well. 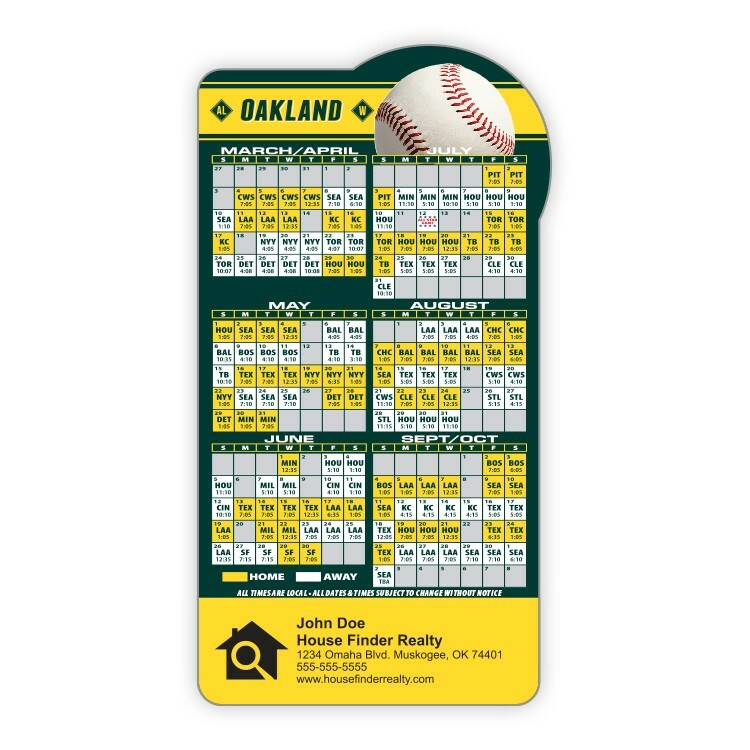 Always-in-stock with an approximate 0.020 material thickness, these customizable marketing tools are available with all pro sport team schedules. 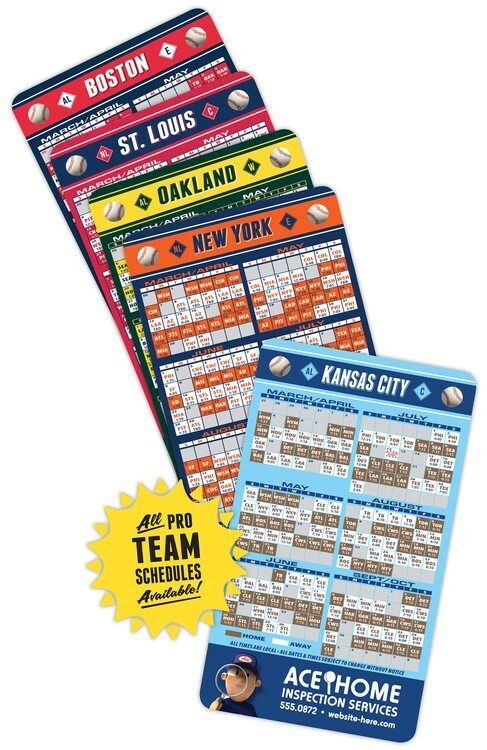 Plus, we can set up college and local teams too! 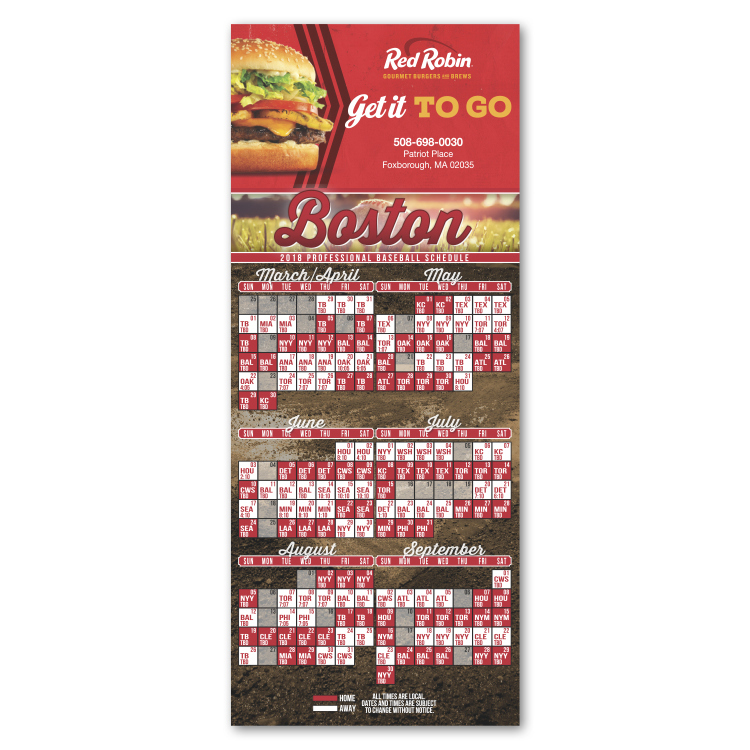 Great for corporate sponsorship programs. 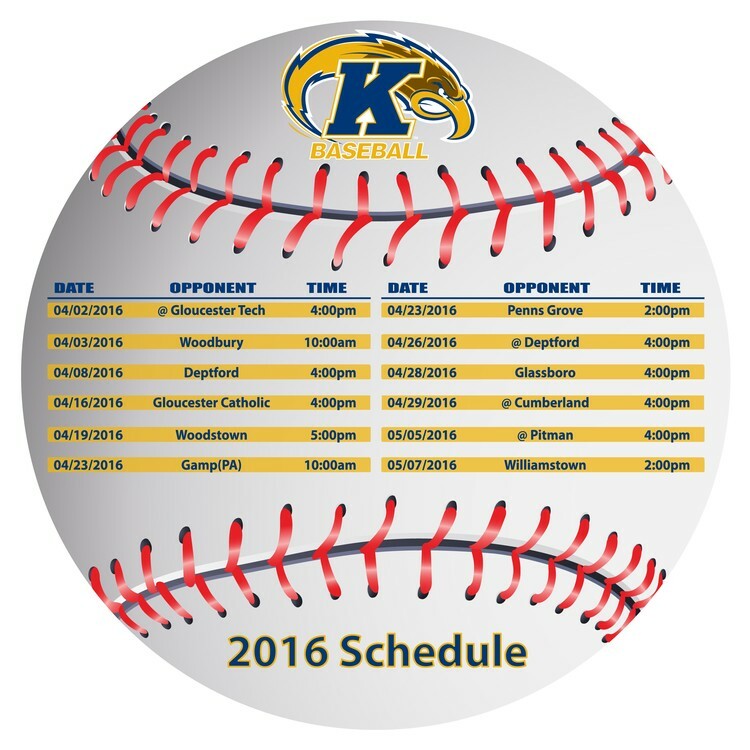 Sports are a big part of any community. 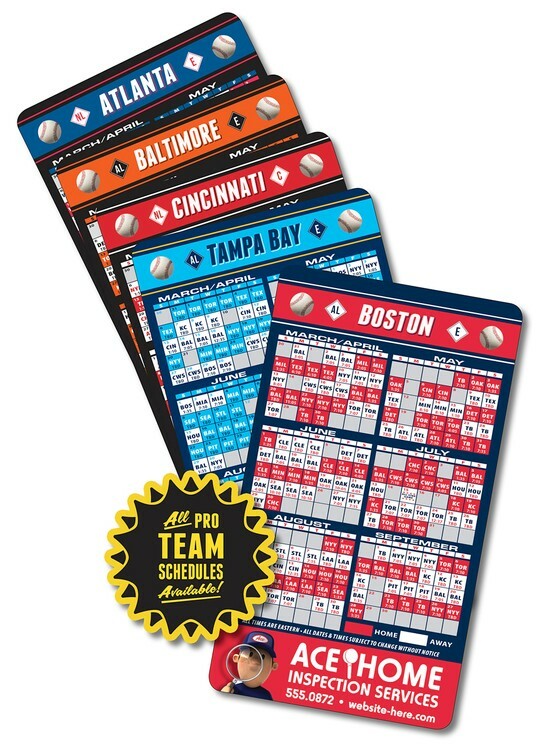 By adding your name and logo to a 3-1/2 x 8-1/2 baseball-themed schedule magnet, you can show your support for local teams! 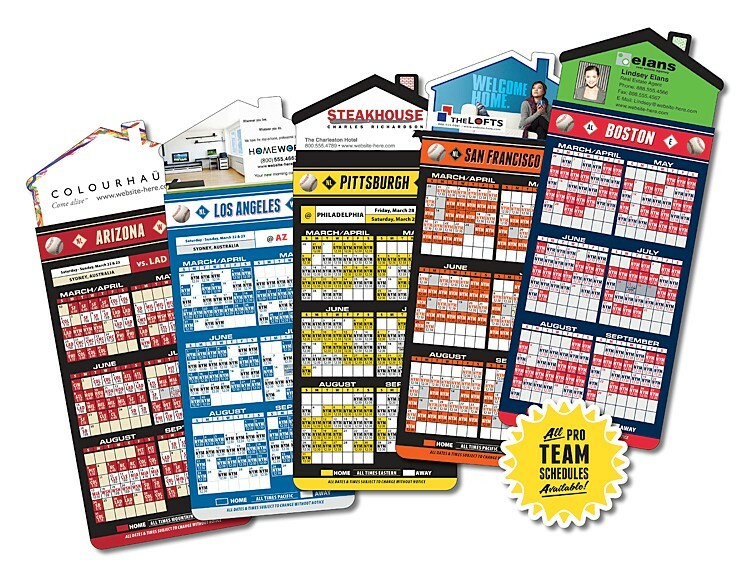 Always in stock with an approximate 0.020 material thickness, these customizable marketing tools are available with all sport team schedules. 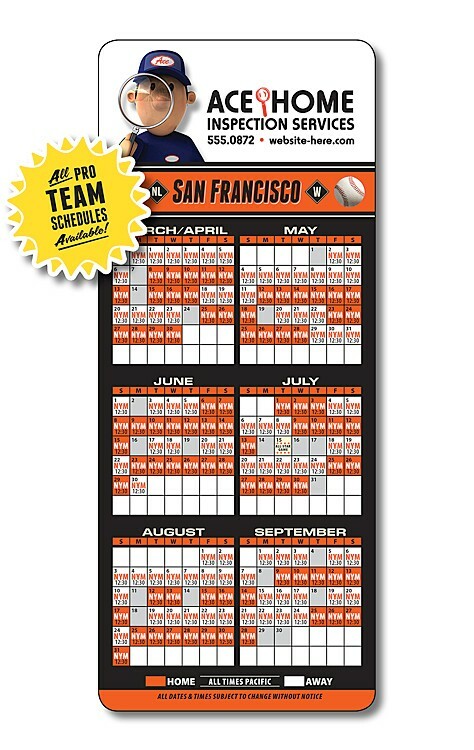 When ordering, be sure to specify which team schedule you want. 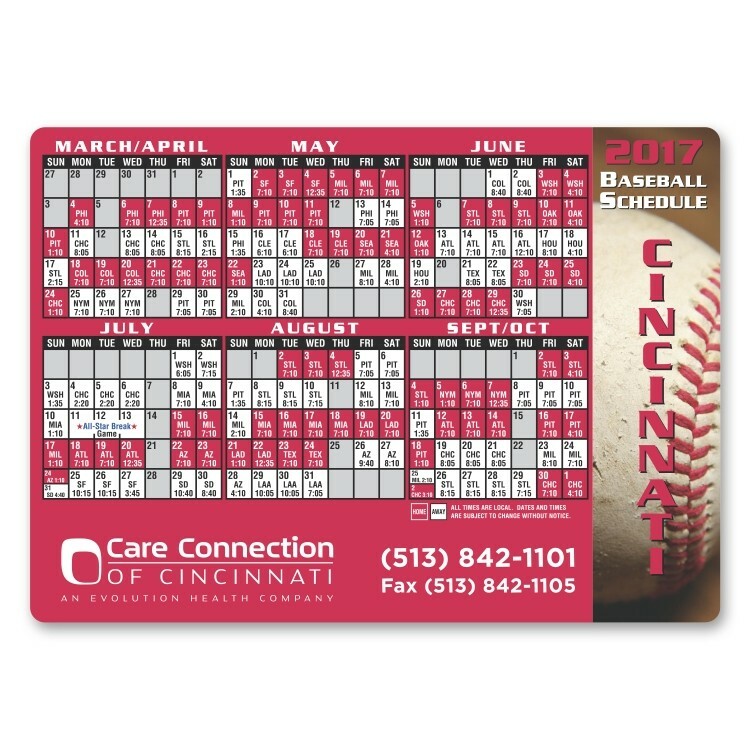 Sports are a big part of any community. 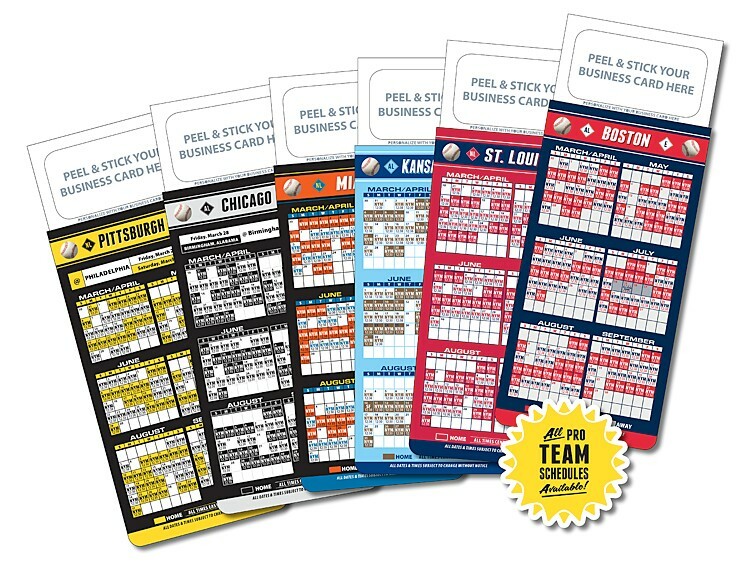 By adding your name and logo to a 3-1/2" x 8-1/2" baseball-themed schedule stick-up card, you can show your support for local teams! 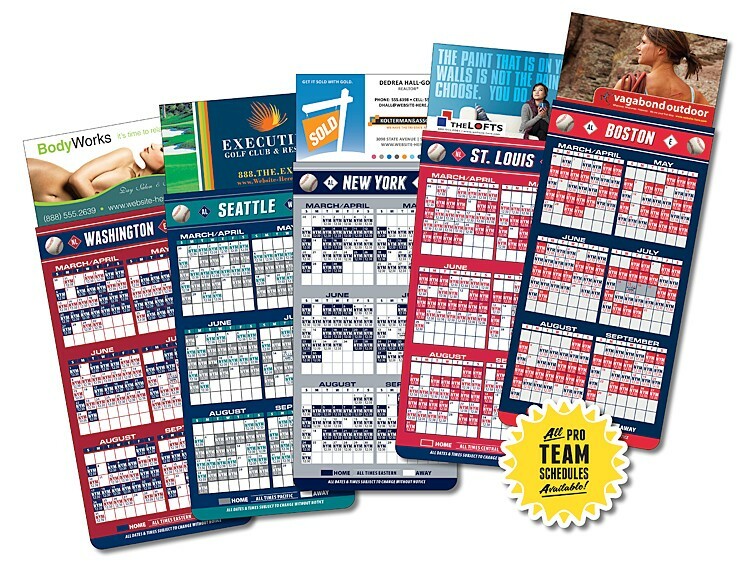 Always in stock, these customizable marketing tools are available with all sport team schedules. 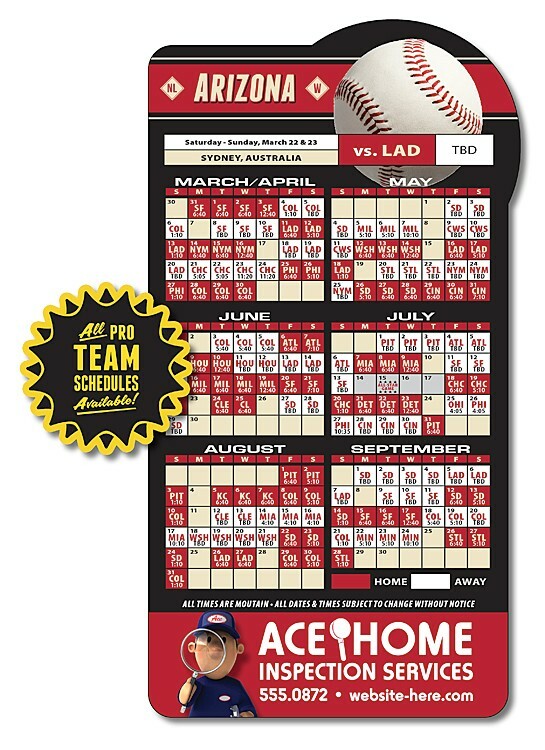 When ordering, be sure to specify which team schedule you want. 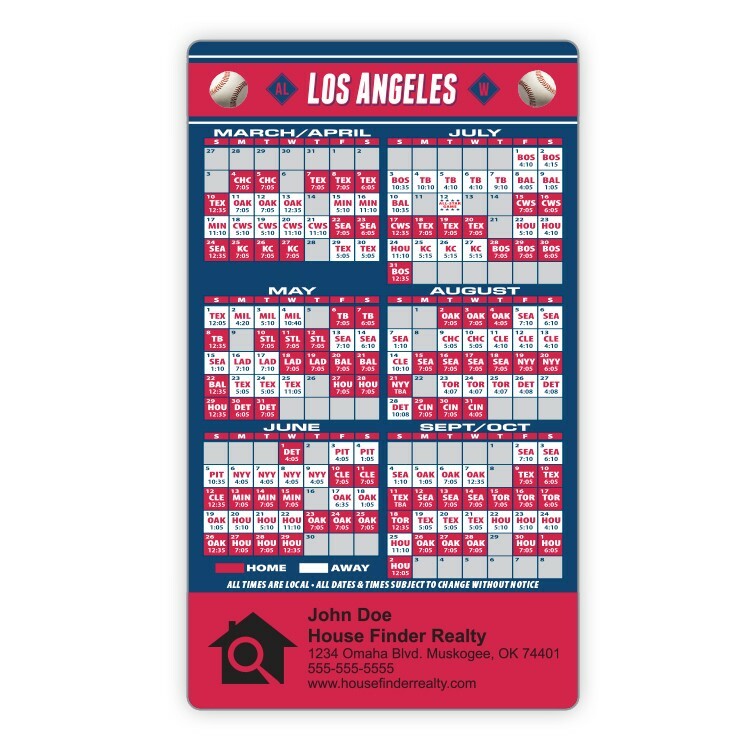 Make your brand stick with this colorful and creative baseball schedule magnet! 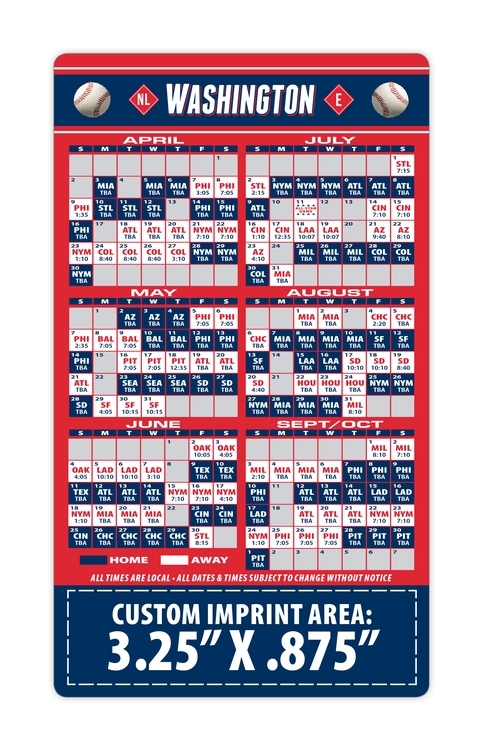 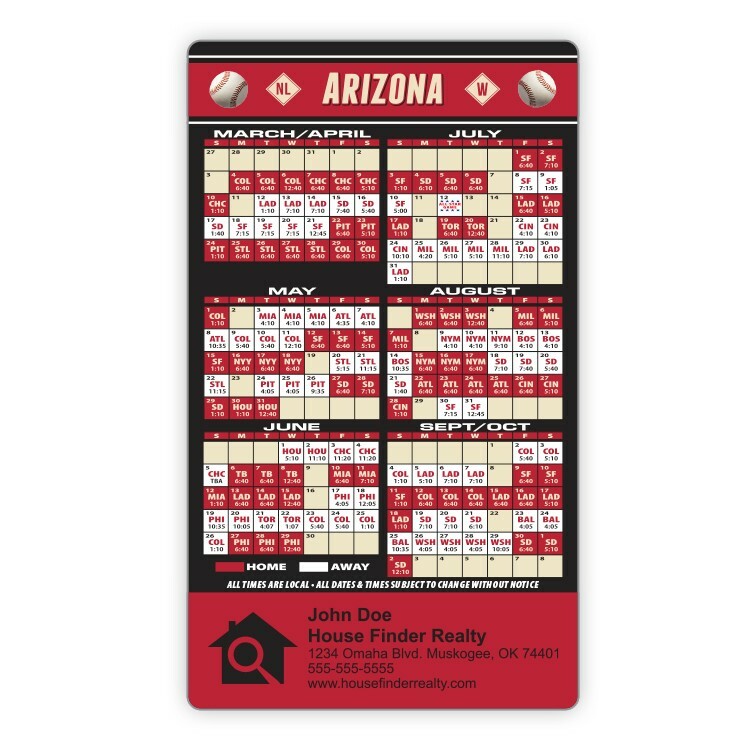 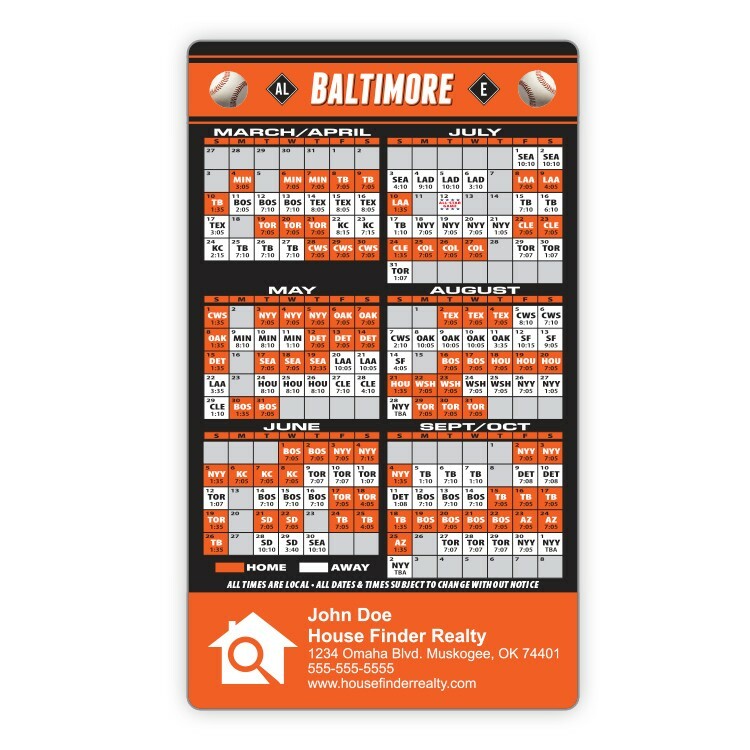 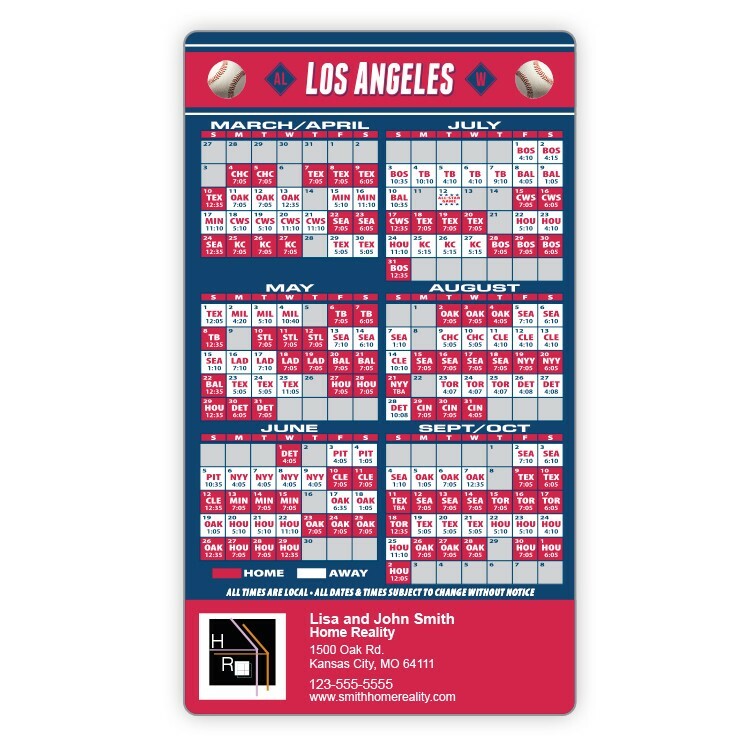 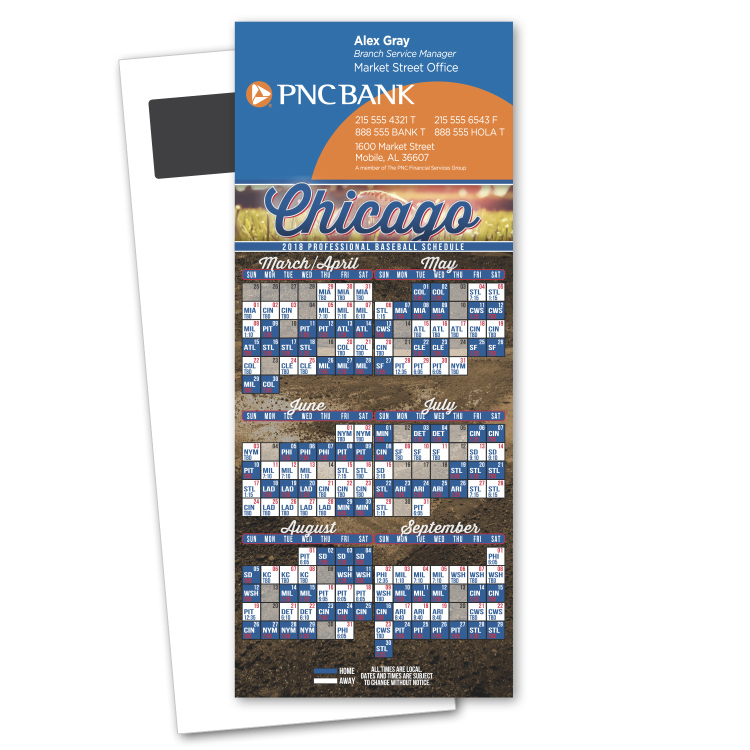 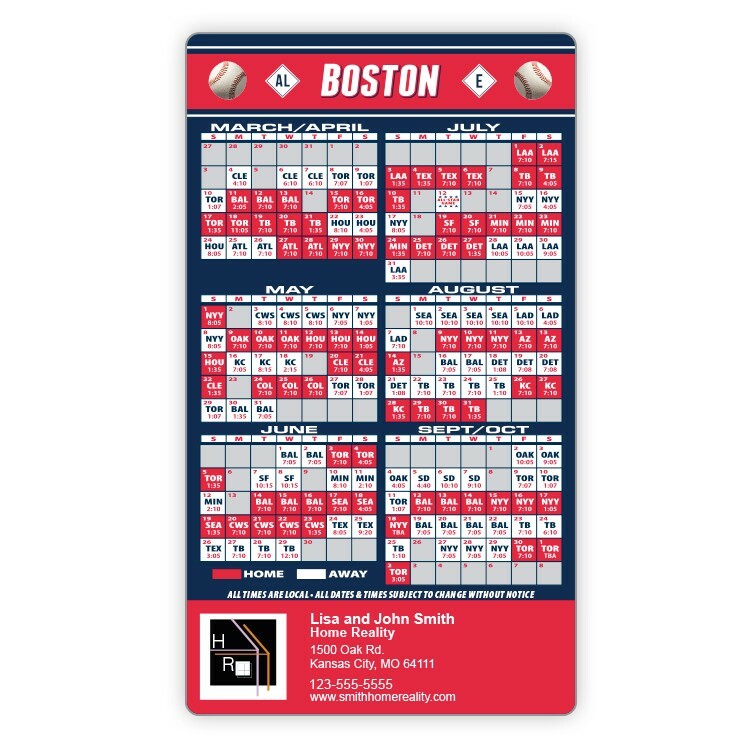 This baseball schedule magnet is printed in full color and will surely stand out from the competition. 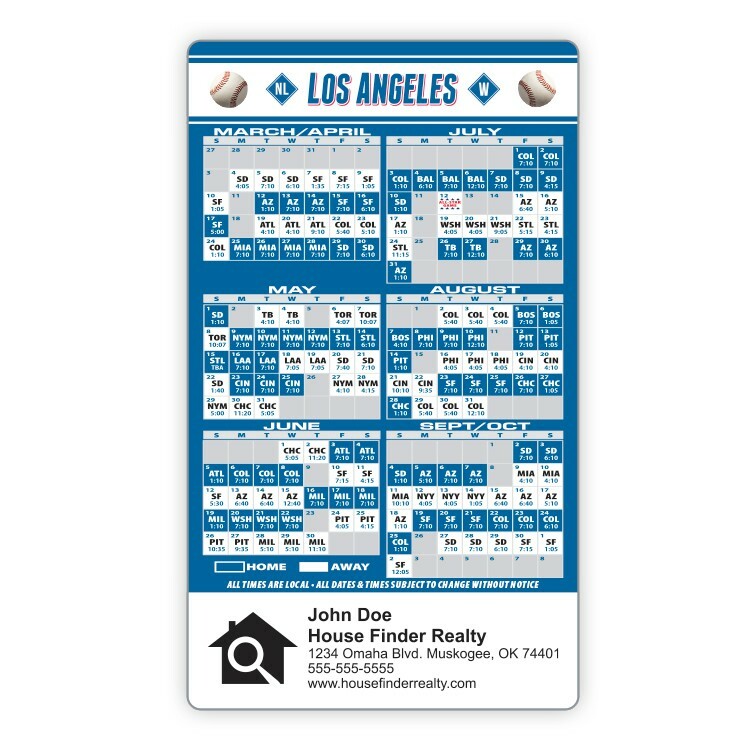 Price includes four color printing on a white magnet. 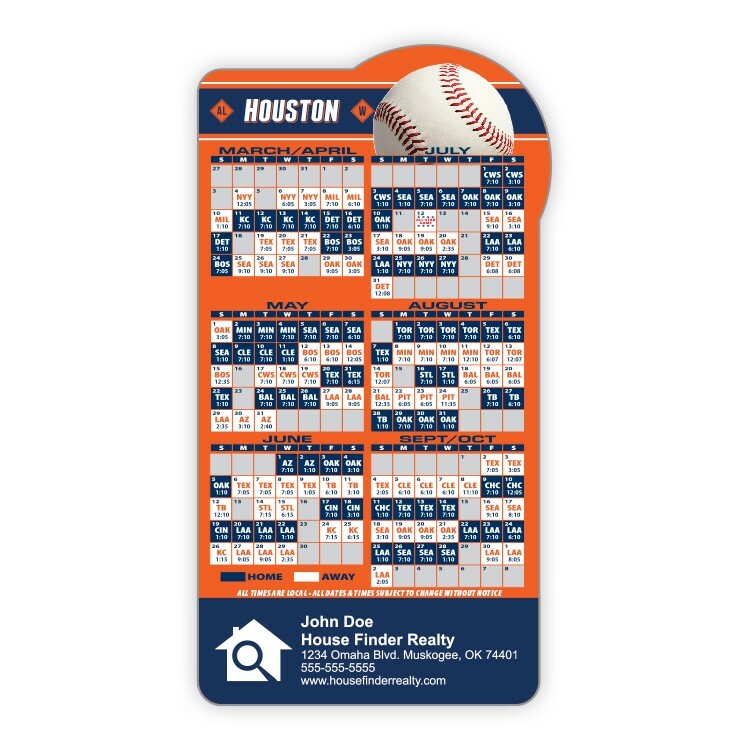 Other custom magnet shapes and sizes available, please call for details. 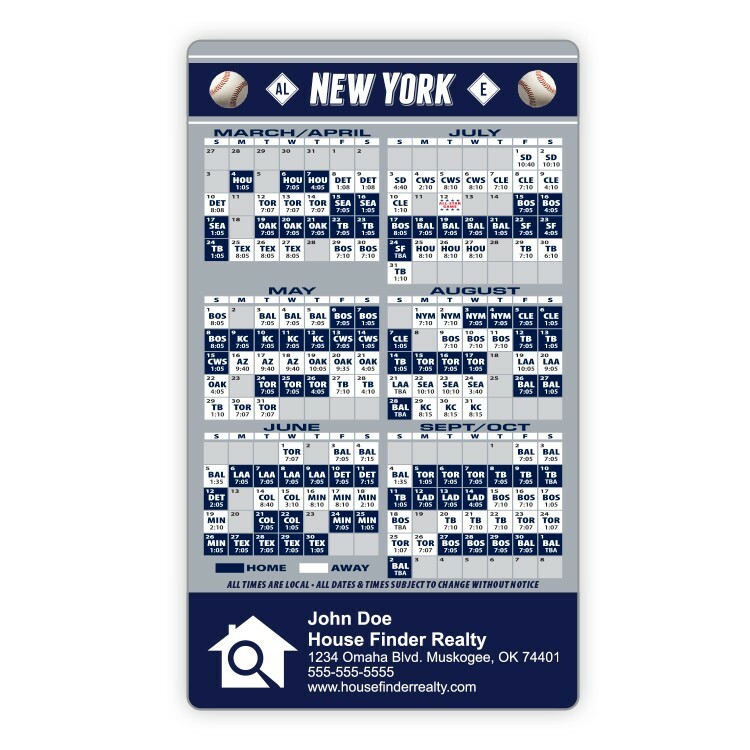 These magnets are for indoor use only.  EQP pricing not available on this product.